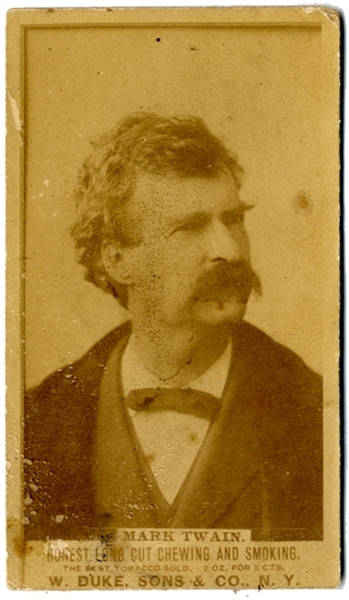 Unusual advertising carte de visite of Mark Twain, for the "W. Duke & Sons" tobacco company. Fine condition. Mark Twain (18351910), real name Samuel Langhorne Clemens, was an American writer, humorist, entrepreneur, publisher, and lecturer. Among his novels are The Adventures of Tom Sawyer (1875) and its sequel, the Adventures of Huckleberry Finn (1885), the latter often called "The Great American Novel". W. Duke, Sons & Co. was a tobacco manufacturer founded by Washington Duke in 1881. His son, James B. Duke, later became president of the American Tobacco Company. Collection comprises a volume containing meeting minutes for shareholders and the Board of Directors, 1885-1891, along with a volume of company costs and expenses, 1909-1953. There are also advertising materials dated 1876-1904, including trading cards, albums, and other advertising collectibles from the W. Duke Sons & Co., Liggett & Myers, American Tobacco, and other tobacco companies.